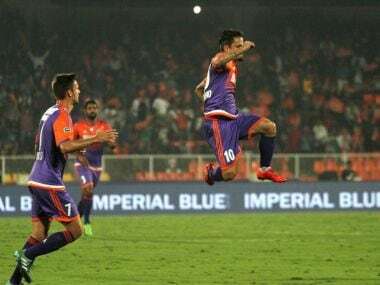 Guwahati: Last year's golden boot winner, Marcelinho proved to be FC Pune City's saviour as he scored a late goal to hand his team a 1-0 win over NorthEast United FC on Wednesday. When it seemed like the match was heading for a draw following a spate of missed chances at both ends, Marcelinho delivered the winner in the 86th minute. The goal could prove to be decisive in the final analysis for Pune City as they have now moved to the second spot with 25 points from 14 matches and are much closer to qualification for play-offs. NorthEast United continues to be at ninth spot with 11 points after 13 matches and may find it difficult to qualify even if they win all their remaining five matches. NorthEast United had done well to keep a clean slate till the late stages of the match when their poor record at home came to haunt them. NorthEast United have not managed to keep a clean sheet at home since their first home match and they conceded at the fag end. It was Marcelinho who got the goal that Pune were hunting for all night and came when the visitors had pulled out their top scorer Emiliano Alfaro. Substitute Marko Stankovic made it happen with a delightful through ball for Marcelinho. The Brazilian striker kept his cool despite being chased by two NorthEast defenders and then beat onrushing goalkeeper TP Rehenesh. Till Marcelinho managed to break the deadlock, both teams had chances to seal full points. Pune City had the best opportunity in the opening half and it was Alfaro who missed a sitter. A long ball from Marcos Tebar saw NorthEast defender Nirmal Chhetri try to head it back to his own goalkeeper but his touch was weak and instead the ball fell for Alfaro, who tried to chip the ball over the goalkeeper but his heavy touch took the ball over the goalpost. NorthEast too had their chances, particularly in the second session. The best chance fell at the feet of Lalrindika Ralte when Seiminlen Doungel's cross from the right was clipped by Cezario and fell nicely for Ralte but he disappointed with his finish as he dragged the ball across the face of the goal. Jose Goncalves also went close for the hosts when Ralte's corner-kick saw him left unmarked but the captain's header went straight into the hands of the goalkeeper. 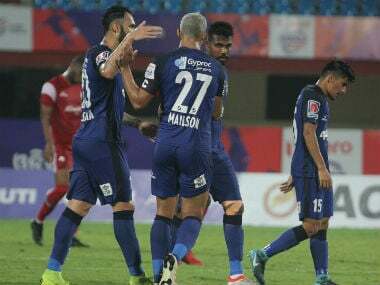 Pune City will now travel to Mumbai for the reverse leg of Maharashtra Derby on Sunday, while the Highlanders travel to Jamshedpur for their next fixture.